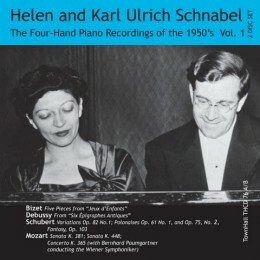 The Schnabel Music Foundation, in cooperation with TownHall Records, Chatham, NY, publishes historic recordings by Karl Ulrich and Helen Schnabel. Artur Schnabel’s recordings of the classics are still widely available for sale; therefore SMF has elected not to reissue these recordings. The only exception is TownHall Records THCD-74 which presents a live recording from 1939 that has never before been published. All CDs produced by the Schnabel Music Foundation have been carefully digitized and remastered from the best preserved long-playing records, and, where available, from the analog magnetic tapes. No further CD issues are currently planned. We also show the documentary on Karl Ulrich Schnabel’s teaching as it is intimately related to the mission the Schnabel Music Foundation pursues. 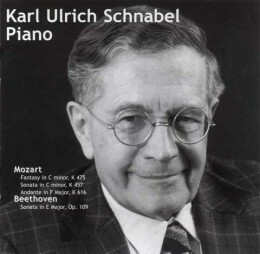 Karl Ulrich Schnabel (1909-2001), the son of famed pianist Artur Schnabel, began playing piano at the age of five and made his concert debut in 1926. In the following decades, he pursued a brilliant solo career as well as reviving the piano duo tradition, first performing four-hands with his father, then his American wife, Helen Fogel, and later with Joan Rowland. During his long career, he was also the teacher of several of the great pianists of our time, including Leon Fleisher, Peter Serkin, Richard Goode and Claude Frank. This video includes biographical material about the Schnabel family, comments by Schnabel’s famous former students, and concentrates on Schnabel’s later years as a master teacher. 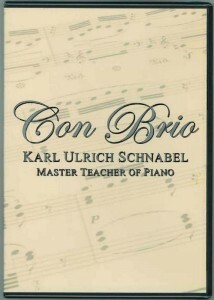 “Con Brio” is a musical term meaning spiritual fire, a cornerstone of Schnabel’s teaching. The effect of this passion upon both pupil and audience is deeply moving. 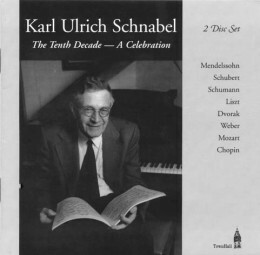 Schnabel also possessed a special genius to teach what most believe to be unteachable–musicality. Through the power of his dedication and example, he touched thousands during his remarkable life and career. 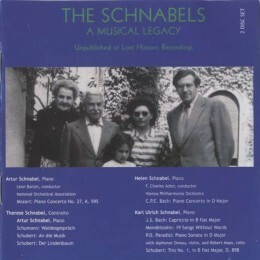 The first in a distinguished series of recordings from the Schnabel Music Foundation, this disc features compositions by Artur Schnabel from several periods of his life played by Artur Schnabel’s student and daughter-in-law Helen Schnabel. 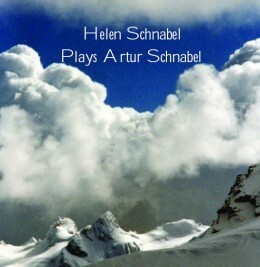 Helen was coached by Artur Schnabel in preparation of these recordings. Concerto for Piano and Orchestra (1901) with C.F. Adler and Vienna Orchestra, Seven Piano Pieces (1948), Reverie (1898), 10 Songs (1899-1903) with Erika Francoulon, soprano. 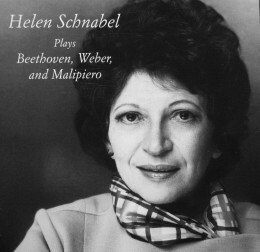 Helen Schnabel sought out gems of the piano literature for her recordings that had largely been neglected. Here she plays the original transcription by Beethoven of his famous violin concerto (with C.F. Adler and Vienna Orchestra), plus two little known works for solo piano. Ludwig van Beethoven: Concerto for Piano and Orchestra, No. 6, Op. 61. Carl Maria von Weber: Sonata No. 4 in e minor, Op. 70, G. Francesco Malipiero: Poemi Asolani (Poems of Asolo). K.U. Schnabel accompanied his mother, the eminent lieder singer Therese Behr Schnabel already as a teenager. Here he received the deep and intimate knowledge necessary to interpret the classical composers including Mozart, Beethoven, and Schubert with the incredible breadth of emotions he demonstrated and also taught throughout his life. This all Schubert CD comprises the Sonata in a minor, Op. 42, D. 845, the Moments Musicaux, Op. 94, D. 780, and the Wanderer Fantasy, Op. 15, D. 760. 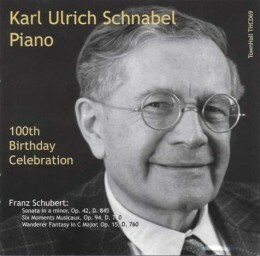 Karl Ulrich Schnabel was highly regarded as a master teacher by a whole generation of pianists for his deep knowledge and understanding of the essence of the great classical composers. On this CD he performs what he taught, exquisite renditions of Mozart and Beethoven piano solo works. The CD comprises Wolfgang Amadeus Mozart: Fantasy in c minor, K. 475; Sonata in c minor, K. 457; Andante in F Major, K. 616; and Ludwig van Beethoven: Sonata in E Major, Op. 109. The Schnabel four-hand duo performed with great success all across America and Europe. They were known to truly play as one. On this 2-CD set a selection of their eclectic repertoire is presented encompassing such diverse composers as Wolfgang Amadeus Mozart, Antonin Dvorak, Carl Maria von Weber, Franz Schubert, Georges Bizet, Felix Mendelssohn, and Johannes Brahms. 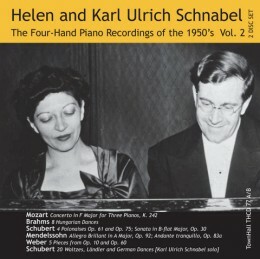 Helen and Karl Ulrich Schnabel enjoyed an enviable reputation across Europe and the United States as the 4-hand duo playing as one. Their repertoire spanned a wide range of original music written for piano duet. The first of two 2-CD sets features: Bizet, five pieces from Jeux d’Enfants; Debussy, three pieces from Six Epigraphes Antiques; Schubert, a selection from Herold’s “Marie” Variations, and the Fantasy, Op. 103; Mozart: Sonata K. 381, the Concerto K. 365, and the Sonata for two pianos K. 448. 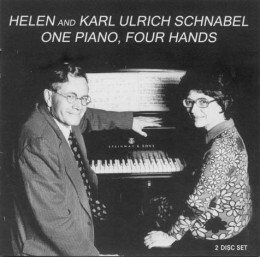 Helen and Karl Ulrich Schnabel enjoyed an enviable reputation across Europe and the United States as the 4-hand duo playing as one. Their repertoire spanned a wide range of original music written for piano duet. The second of two 2-CD sets features: Mozart, Concerto in F Major for Three Pianos, K. 242; Brahms, 8 Hungarian Dances; Schubert, 4 Polonaises, Sonata in B-fl at Major, Op. 30; Mendelssohn, Allegro Brillant, Op. 92, and Andante tranquillo con variazioni, Op. 83a; Weber, Five Pieces from Op. 10 and Op. 60. For the first time all four eminent Schnabel musicians are united on this 2-CD set. Artur Schnabel is heard in the 1939 Carnegie Hall performance of the Mozart Piano Concerto No. 27, L. Barzin, cond. Artur and Therese Schnabel present Schubert and Schumann Lieder. Helen Schnabel plays the C.P.E. Bach Piano Concerto in D Major, and Karl Ulrich Schnabel performs the Capriccio by J.S. Bach, 19 Songs Without Words by Mendelssohn, as well as the Schubert Trio No. 1 with Alphonse Onnou, violin, and Robert Maas, violoncello.